Foggy and cold at first. Overcast with showers late in the day. I got up at 5:30am having gone to bed quite late after catching up on email, etc., and felt tired and maybe not ready for another day of exertion. Anyway, I packed all my now-clean gear, ate the breakfast I had purchased at Woolworths last night and walked 100 metres to the Tumut Courthouse where I was to meet the school bus at 6:45am. There was a heavy fog and it was cold. I walked on the spot to keep warm until the bus eventually arrived around 7am. I paid my $2 and chatted with the driver as we covered the 10km to my starting point for the day. It was still very foggy, but the bus driver assured me that it would soon lift, as it did over the next hour as I followed a country road through autumnal foliage and past working farms to reach Blowering Dam. My route then climbed up through the forest to the right of the dam wall before becoming a very pretty foot-track along the edge of the Dam but high enough to be in the bordering forest. 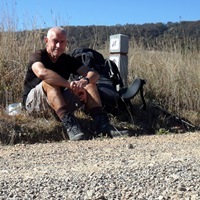 I gather I am now covering the same ground as the Hume & Hovell Trail Ultra Race and, if it continues like this, I will be tempted to return in October to participate. For the next hour or so, the trail either bordered the Dam or turned inland to cross old farmland, slowly being reclaimed by the bush after the owners moved out to accommodate the Dam. For some reason, I was feeling quite tired and plodding a bit, maybe because of insufficient sleep, and spent a lot of time listening to the radio to take my mind off the fatigue. The scenery, however, was fantastic and this section is one of the highlights of the trail thus far. I had an early lunch break at Browns Creek Campsite and thereafter the trail followed fire trails, a lot of the time through pine plantations, but also passing by some lovely undeveloped grassy Dam-side picnic/camping areas populated with yellow-leaved trees and kangaroos. At the top of one climb I checked my phone messages and returned a call from a National Parks ranger to confirm details of my encounter with the fire-lighters on Sunday afternoon. Apparently the controlled burn wasn't approved and will be followed up. I was making good time in the afternoon, but the day was passing slowly. I was hoping to find accommodation at an old Forestry Camp, but had not been successful in contacting them. I thought about just turning up and, on the assumption it was out-of-season, just finding some where to get water and camp under shelter. It had started to drizzle occasionally and the forecast was for showers later. When I reached the general area of the Forestry Camp, it wasn't readily identifiable and what buildings I could see had Private No Entry signs on the approaches. I decided to carry on in case the camp was further on, but it wasn't. At this point I saw the first emus of the trip, joining hundreds of kangaroos grazing on the old pasture land. I carried on another couple of kilometres and arrived at another attractive picnic area but with no benches/tables or shelter or water. It was approaching 4pm and I decided I was better to camp while I could see and before the rain arrived. I found a spot where some fallen logs provided a table and set up my tent in intermittent light rain. I filled my water carriers from the dam and decided to forgo a wash since it had been cool all day and I hadn't really raised a sweat. I cooked and ate dinner in the cloudy gloom of the early evening, observing the occasional headlights travelling the Snowy Mountains Highway across the other side of the dam. I retired to my tent soon after 6pm to write up my diary and later will listen to the Federal Budget speech on the radio (I know it's sad, but I'm a helpless news junkie and former economist). I have my fingers crossed that it will not be raining when I get up, or it will be very difficult to pack without getting everything wet.